So, I've never made panzanella...until Tuesday, that is. 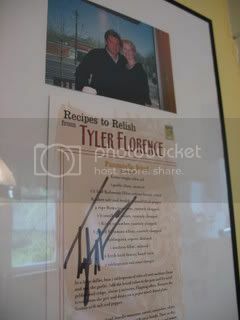 And, I even have a framed panzanella recipe hanging in my kitchen! (I was apparently in a soccer mom look-a-like phase, yikes). 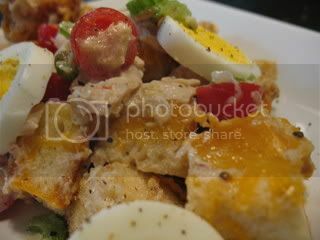 Panzanella is a Tuscan bread salad that typically consists of day-old bread cubes, tomatoes, cucumbers, red onions, and a vinaigrette. I've been eating lots of raw veggies lately and was looking for something a bit more substantial than the traditional panzanella recipe. So, I made up my own...inspired by a tuna melt sandwich (which I had been craving). Toss the bread with with the oil, garlic, salt & pepper. 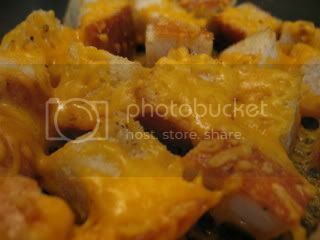 Arrange in a single layer on a baking sheet & top with the shredded cheese. Bake at 350 for about 5 minutes, or until the cheese is melted. Remove from oven. Whisk vinegar & mustard in a small bowl. Slowly drizzle in olive oil while whisking. Season with salt & pepper. I finished the salad last night after class, and it was even better the next day. 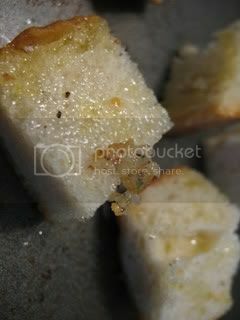 The bread cubes soaked up the flavors but were still crunchy! Sounds fantastic and your pictures really do it justice! Nummy!